the RESTAURANT DESIGN & RE-BRANDING Bars, Restaurants & Nightclubs. -Need A Total Re-Design & Re-Brand? -Need a Professionally Designed Floor Plan? -Need Information About Design & Renovation Costs? -Have Questions About Designing and Building a Bar, Restaurant or Nightclub? If you are about to launch a new venture, or re-brand an existing business, please call Restaurant Designer Raymond Haldeman before you spend your hard earned money. A successful former owner/operator himself of Bars, Restaurants & Nightclubs, his credible and valuable guidance has helped many operators successfully Open or ReBrand their businesses and compete in todays ever evolving market. As a prospective client, Restaurant Designer Raymond Haldeman will personally give you a Free 1 on 1 Phone Consultation about your plans to open a New Venture or Rebrand / Renovate an existing one. Take a moment and give him a call, you'll be surprised how many of your questions will be answered in just 1 telephone call. Restaurant Designer, Raymond Haldeman has been profiled in many reputable publications including The NY Times, Hospitality Design Magazine, Money Magazine, The Wall Street Journal, USA Today, The Robb Report, Gourmet Magazine, Bon Appetit, Town & Country, The Hollywood Reporter, The Houston Chronicle, Philadelphia Magazine, The Courier Post, Ocean Drive Magazine, The Philadelphia Inquirer, The Main Line Times, The Palm Beach Post, Clematis Magazine, and Parade Magazine to name more than a few! All photos below are restaurant designs by Designer Raymond Haldeman, click here for complete portfolio. Call NOW for a Free 1 on 1 Instant Consultation with Restaurant Designer Raymond and get your questions answered! Tell Raymond about your project and he will call you personally and discuss your plans and answer your questions. Restaurant Designer Raymond Haldeman custom designed this pinwheel banquette as a centerpiece of Cuzin's Dinging Room seating. Restaurant Designer Raymond Haldeman took this weathered deck at the Timber Breeze Resort in Wisconsin's Northwoods and replaced 3 picnic tables with an income generating Pavilion Bar that exploits the view of Butternut Lake. 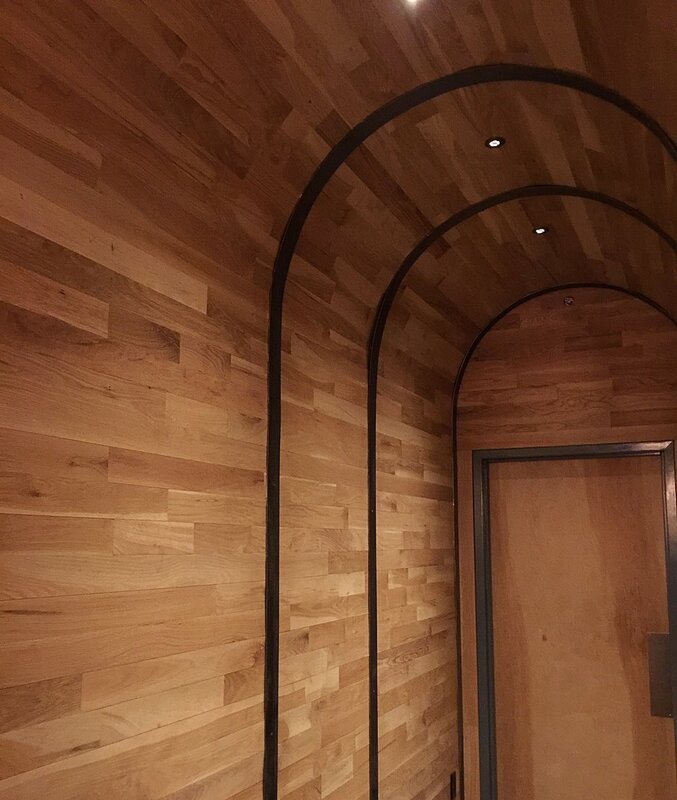 Inside New Pavilion with Hand Crafted Wood Bar & Floating Soffit after Raymonds Restaurant Designer magic. Transparent dove gray stain on ash wood tables with high-back dove gray leather banquettes. 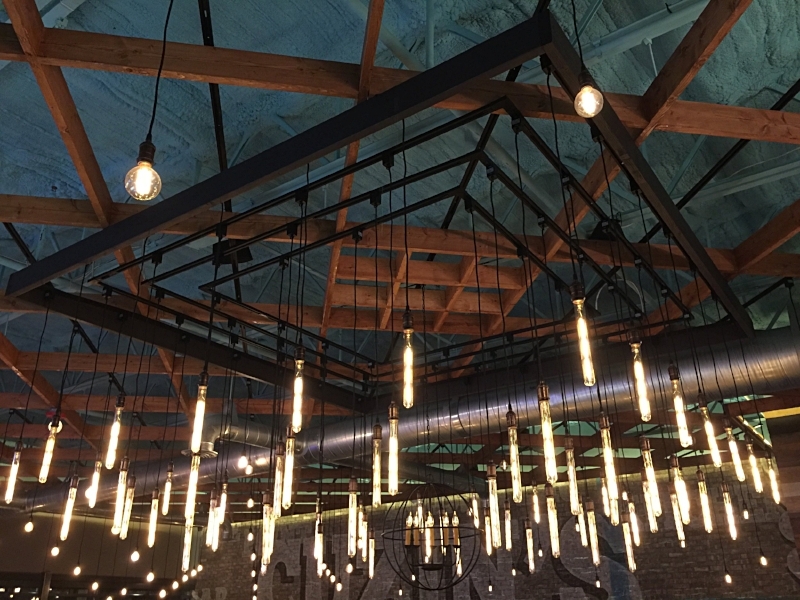 The Restaurant Designer gutted the former Pilot House in Cape May, NJ, and created an underwater arbor ceiling treatment that wows customers during their dining experience at the new FINS Bar & Grille. Drab and dated decor "BEFORE"
"After" A 14' long aquarium above the carrot tweed banquette designed by Raymond Haldeman, the Restaurant Designer. Raymond combined his restaurant interior design skill with his years of experience as a restaurant operator and replaced the old wood bar with booth seating and then built a new custom poured LED edge lit glass bar which he positioned the front of the restaurant in the windows for all to see as they walked by. His objective was to create an additional income stream of late night bar business...it worked! Talk about a TOTAL TRANSFORMATION, restaurant designer Haldeman took the musty old "Ships Inn" in Northport and was able to create a space, mood, and experience TOTALLY unrelated to its previous incarnation and reintroduce it to the community of Northport, Long Island as "7T8" European Fusion. "BEFROE" The Ships Inn resemble every other restaurant on Main St in Northport, LI, NY with shellacked wood paneling installed half a century ago. "AFTER" This LED wave wall was the centerpiece of the space noe, "7T8" and provided the wow-factor for this restaurant design by Raymond Haldeman. "After" The small space did not have a bar, so restaurant designer Raymond Haldeman took space from an unused bus-station and angled the Marble & Onyx Bar. Here, the restaurant designer replaced old wood paneling with recessed mirrors encased in boxed woodwork and added high-back banquettes to replace the old diner-like booths. "Before" Old diner-like booths at Ships Inn, "
"After" The natural wood grain in the ash wood tables is highlighted by the translucent dove gray stain. Raymond, "The Restaurant Designer" updated this sunny dining room with the addition of a see-thru fireplace to the main dining room and open-sky ceiling treatment. "After" The upper row of windows was removed during construction and an open ceiling with a floating infrastructure for lighting was created by restaurant designer Raymond Haldeman. "After" The finishing touch was a GIANT see-thru fireplace clad in Stainless Steel and Reclaimed Barn wood, an excellent example of extraordinary restaurant design by Raymond Haldeman. Restaurant Designer, Raymond Haldeman, removed the fake appliqués and stripped the building down to its original straight forward design. His selection of a vibrant blue exterior color and blue & white stripped awnings was the perfect combo and alternative look for the new seafood restaurant in Cape May, NJ. "After" The exterior was stripped down to its original form. "After" Clean & vibrance turned out to be a visual hit but restaurant designer Raymond Haldeman! The old musty booths were removed and replaced with a spectacular LED edge-lit glass bar top facing the windows in the front of the building. As an experienced restaurant designer and former owner/operator Raymond knew that tourists would not be able to resist the appeal of the high style bar and assured his clients it would serve as an invitational billboard for the restaurant. Indeed it does! "Before" Drop-ceilings, old wood and laminate table tops. The magnificent bar-top and Stainless Steel Liquor Soffit proved to be an efficient use of space, providing 60 linear feet of bar-top and good storage. Knotty Pine was everywhere when the restaurant designer showed up at the Timber Breeze Resort in Wisconsin's Northwoods. Raymond Haldeman the restaurant designer gave the Butternut Lakefront resort a professional restaurant designer makeover using local carpenters, craftsmen and millworkers. The old stone fireplace was raised 42" from the floor, giving all diners the prospect of a view of a flaming hearth. Experienced restaurant interior designer Haldeman used stack stone and patina copper to face the front of the fireplace. "Before" The old stone fireplace and ladder back chairs. Plush leather tufted ottomans, and upholstered seating surround the fireplace. This dining room and bar received a total makeover by restaurant interior designer Raymond Haldeman, new floors, mirror treatment above plush turquoise suede banquettes, res colors and natural ash wood tables. "Before" A complete gutting of the space was needed to upgrade the integrity of the building that was operating as a bar & restaurant since 1942. "After" The fresh new look has character & personality! "After" A recessed lighting treatment give the new space an ambient illumination. In this space the restaurant interior designer designated the elevated balcony at La Fusion in Philadelphia as the VIP Lounge and was "glammed-up" with LED back-lit mirrors and contemporary crystal chandeliers. This Italian restaurant, “Tonino’s” wanted the restaurant design of its expansion to be light, casual and contemporary. All three were accomplished with color selection, architectural ceiling treatment and LED illuminated Modern Art. Drop ceiling removed and replaced by architectural gird opened up the space and gave it a more contemporary feel.